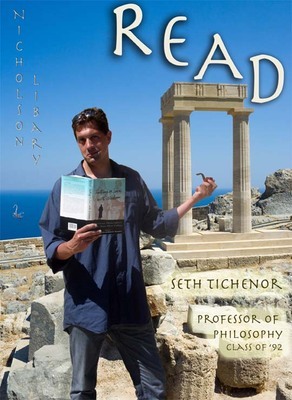 Seth Tichenor, Instructor of Philosophy, class of 1992, reading Falling in Love with Wisdom: American Philosophers Talk about Their Calling, edited by David D. Karnos and Robert G. Shoemaker. Terry, Paula and Nicholson Library Staff, "Seth Tichenor READ Poster" (2008). READ Poster Gallery. Image. Submission 40.